Celebrate the day with this banner. 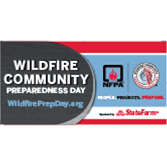 Use this 72” X 36” 4 color polypropolene Wildfire Community Preparedness Day Banner with wind-resistant slits and 6 grommets to proudly promote your participation in the day and encourage others to join in. This brightly colored banner is durable, weather resistant and is visible from long distances.